This building in Aberdeen Place was put on the market for £4.25 million and subsequently converted into apartments, at the time it was on the top 10 endangered list by the Victorian Society in 2007 is a testament to one man’s optimism. It was built as the palatial Crown Hotel in 1898 by Frank Crocker who had heard that a new rail terminal was to be built here. HE SPARED NO EXPENSE; every wall, window and ceiling is decorated in sumptuous style, with elaborate stucco featuring frolicking cherubs, with fine pillars and nice Victorian wood panelling. It had a grand saloon with marble bar-top and pilasters, marble stringing, marble archways, even a great marble fireplace; with a magnificent Jacobean-style coffered ceiling of the most intricate plasterwork; and acres of gleaming woodwork. Probably the craziest was perhaps the bust of Caracalla a sly demonstration that the pub’s designers were quite conscious of the excess to which their client was pushing them: Caracalla was a Roman emperor known for his architectural excesses and his complete insanity. Alas for Crocker! The truth is that while London as a whole may have welcomed the influence of the railway, most of the historic landlords and the well-heeled residents of this part of St John’s Wood did not. Their opposition forced the railway builders to tunnel under Lord’s Cricket ground and then the line turned left a few degrees at St John’s Wood, to terminate not at his doorway, but about a mile away, where Marylebone Station now stands, so expensive was this tunnel that the train operators were forced to economise on their own stations, that is why Marylebone Station is modest compared to say, St Pancras. The Crown Hotel was a palace in the middle of nowhere; the grandest folly in London so tragic that London has been laughing about it for over a century. 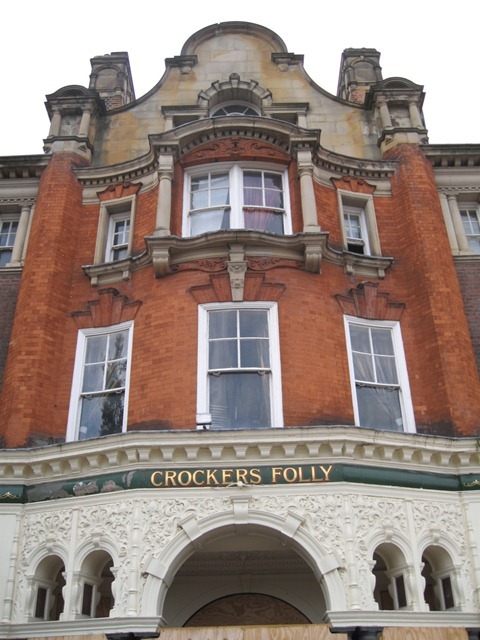 Crocker, naturally, went bust and then killed himself by jumping out of an upstairs window. If you want to see what it looked like back in the 1960s the pub was used in a scene from the film Georgy Girl. This always strikes me as a odd story – although it is all over the net. If built in 1898, that was 5 years after Parliamentary approval had been given to build the railway to its Marylebone Terminus so it was no secret where the station was going to be. A bit of searching around turns up various references to the suicide myth too, Crocker having died of natural causes. That’s very interesting. It just goes to show how an urban myth can spread via the world wide web. Thanks for the information.